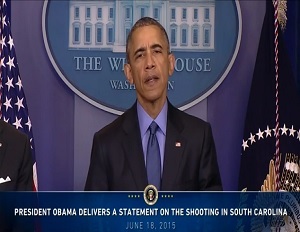 On Thursday, President Obama delivered a speech in response to the senseless mass shooting that took place Wednesday at a historical church in Charleston, South Carolina that left nine people dead. Reports surfaced Wednesday evening about a young man opening fire at Emanuel African Methodist Episcopal Church during a weekly bible study gathering. Eight individuals were found dead at the scene and another one died later at the hospital. The suspect, Dylann Roof, has been apprehended by authorities and the Department of Justice is expected to conduct a hate crime investigation into the shooting that will involve DOJ’s Civil Rights Division, the FBI and the U.S. Attorney’s Office. In his speech, where he expressed his deepest condolences to the families affected by the heinous crime, President Obama talked about the historical imprint Emanuel AME Church has on the black community and the impact this senseless act of violence has on America as a whole. Obama, who expressed that he and Michelle knew several members of the church including its pastor, Reverend Clementa Pinckney, discussed the history of crimes similar to the one in Charleston andÂ how it raises a question about our nation’s dark past. Since Wednesday’s incident, the nine victims who lost their life in this tragedy have been identified. See their names and watch President Obama’s full speech below.